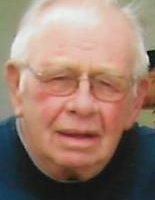 Marvin L. “Gus” Gustafson, 85, of Galva, died at 11:20 a.m., Thursday, January 10, 2019 at his home.Funeral services will be held at 10:00 a.m., Monday, January 14 at the First United Methodist Church in Galva. Pastor Tricia Chapman will officiate. Visitation will be held from 5:00-7:00 p.m., Sunday, January 13 at Rux Funeral Home in Galva. Burial will be in Bishop Hill Cemetery where military rites will be accorded by the Galva Fusiliers. Memorials may be directed to the First United Methodist Church. He was born on October 9, 1933 in Kewanee, the son of Emil and Selma (Johnson) Gustafson. He married LuAnn Spillman on October 25, 1959 at the First United Methodist Church in Galva. He is survived by his wife and his children, Jeffrey (Janeen) Gustafson of Streator, IL and Jill (Rodney) DeClerk of Franklin, TN, four grandchildren; Ryan DeClerk, Cameron (Amanda) DeClerk, Courtney DeClerk and Erin DeClerk, two step-grandchildren, Jarret (Ji Jeong) Kurber and Joshua Kurber, two great-grandchildren, Avery and Adelynn DeClerk, and several nieces and nephews. He was preceded in death by his parents, four brothers; Lennart, Laurence, Oscar and Harold and three sisters; Agnes White, Helen Hultgren and Edith Polson. Marvin graduated from Galva High School in 1951. He served his country in the Army during the Korean Conflict. He had worked as a machinist at Outboard Marine Corporation and later retired from the State of Illinois highway department. He was a member of the First United Methodist Church and the Wesley Weds, the Hagburg-Hamlin American Legion, the Lake Calhoun Country Club and the Wednesday Night Bowling League. In earlier years, he played softball for the Bishop Hill Swedes. He was an avid Chicago Bears fan and a die-hard Cubs fan. He enjoyed playing cards, golfing, bowling, going for coffee and traveling and wintering in Florida. He especially enjoyed his grandchildren. This obituary may be viewed and private condolences left at www.ruxfuneralhome.com.